Phil´s parents took him to a field one day to have a fun afternoon, but he didn’t want to play on his own, he just wanted to sit and think about how it might be to have a dog. 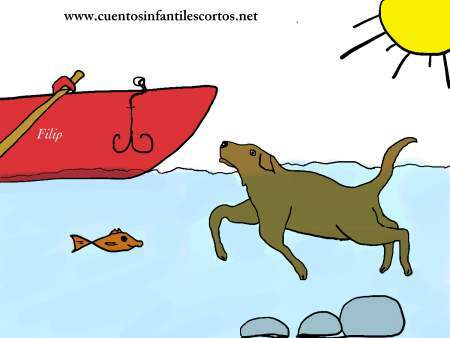 A stray dog that was hanging around saw him drowning and dove into the water to save him. After hearing his cries for hep, Phil´s parents ran to help him, and saw with surprise that a dog was dragging their son out of the river by clutching his collar in its teeth. Once out of the water, Phil looked at his parents and then at the dog and hugged the dog being so grateful that he had saved him. From that moment, Phil´s dream was granted. His parents let him to take the dog home in appreciation for having saved his life from the river current. Since then, Phil has been a happy, joyful and a funny kid, especially with his parents and with his dog whom he named “Saviour” . From that day on, this family has always protected animals and taken care of them, teaching the value that animals can have for people.